Brighton has always been a source of some of the best bands and music in the UK. During the late 70's and early 80's in particular, Attrix Records was both a record store and a record label that sought to capture and record the bands that made up the local scene at the time. The label was best known for a series of compilation LP's (Vaultage 78, Vaultage 79 and Vaultage 80), made up of local bands. One night John Peel played three tracks off Vaultage 78 by Brighton's ska band The Piranhas and suddenly all of the UK were aware of the band and Brighton's music scene. The Piranha's used the exposure to sign a major label deal and tour the UK with other 2-Tone era bands. During the very early days of my band I was able to borrow a copy of Vaultage 80 from a friend at Rutgers University. I was immediately taken with a magical ska/pop track called "Blue Lagoon" by an outfit called The Ammonites. I taped the song on to a cassette tape with other ska and reggae songs and played that tape regularly until I lost it somewhere. Though it only clocked in at 2:18 it was a simple, catchy soulful 2-Tone like ska song featuring great guitar and the best sax solos I had heard this side of Saxa of The Beat. The Ammonites proved there was a ska scene in Brighton that went beyond The Piranhas. I was lucky enough to stumble upon a fantastic quality rehearsal tape that the band recorded in 1980-81. You can listen to each song and/or download each track individually from The Ammonites section of the Punk Brighton Web Site. Take my advice and download all fifteen songs as I think you will agree with me that The Ammonites might have given any of the more established 2-Tone bands (particularly The Beat who they sound a lot like) a run for their money. Of note is their cover of Clancy Eccles "Fatty Fatty" which Bad Manners went on to record. 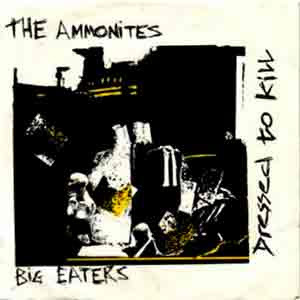 In 1981 The Ammonites recorded a single "Big Eaters" b/w "Dressed To Kill". While the single is hard to find the two songs are part of the rehearsal recordings below. 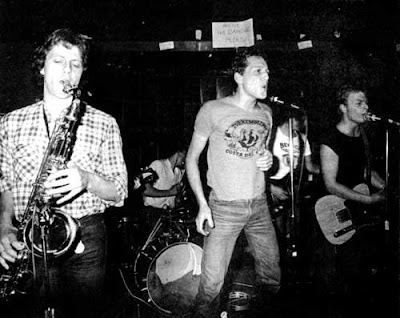 If you want to learn more about the band, click this link (courtesy of the Punk Brighton Web site) to read an article that appeared in Bright Times fanzine in 1980. Below is the track listing for Vaultage 80 which includes "Blue Lagoon" as well as great songs by other punk and rock bands from Brighton. Thanks a lot for this information! I knew the Ammonites when I was looking for punk bands in Brighton (I went there on august -I'm Spanish), but I couldn't find more than 2 songs... thanks a lot! Thanks for your comment! I have always liked The Ammonites and was very happy when I found the rehearsal tape of the band and posted it. I think they could have been very popular. I lived in Salamance for a summer when I was in college. Its a beuatiful place. Funny you say that, being from Spain, the Ammonites used to play at the Alhambra in Brighton.